Cornish Rex Pedigree Show Potential. Healthy Active Kittens 6 months old both male. One Black and White one Brown and White. Litter trained Fully Vaccinated Microchipped and Neutered. Registered with T.I.C.A. Substantial reduction in their price if they go together. These are very affectionate loving kittens. They are outgoing. Ideal for children that are old enough to have been taught to respect animals. They are clean and are very tactile with their humans.They are good with our dogs. I have had cats before. but these are so much more loving. craving attention and entertaining to watch. They love a box with holes in and make up all sorts of games with it. when they have had a play they both like to cuddle up on you and purr. They are unique in the cat world in that their coat is like the softest of velvet. they are active and although they are dainty are extremely strong and healthy as a breed. 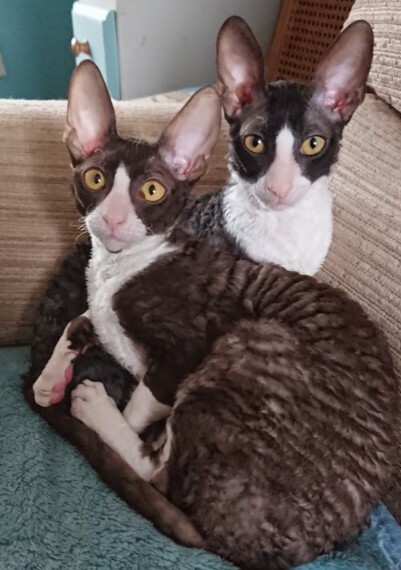 They are both beautiful representitives of the Cornish Rex Breed. I am moving house and can..t take them with me. If you want any more info give me a call.